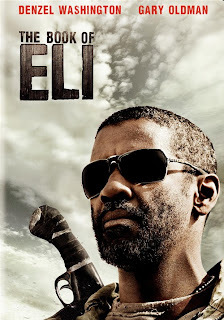 Eli (Denzel Washington) wanders ever westward through a dusty wasteland burned by a devastating war. The people are as hardened and as harsh as the cruel sun. Eli carries a book of enormous value, the only known copy in existence. Gang boss Carnegie (Gary Oldman) knows the power the book has to manipulate and control people, and when he finds out that Eli has it, Eli’s quest becomes more dangerous and violent than ever before. Eli has plenty of language and violence to trim, including multiple uses of the F-Word and enough bullets, blood, and severed heads to make Johnny Woo and the Red Queen smile. Cutting out the violence will create continuity gaps, even if the filters are just on low: most of the violence is graphic in nature. Definitely not a movie for the young. The Book of Eli occupies an uncomfortable movie space by trying to blend violent post-apocalyptic action with a religious, evangelical story. The people that like the religious side will likely be put off by the gore and violence, and the gore and violence crowd may find religious parts out of place. That said, the film is stylistically striking, the acting engaging, and the twist at the end fantastic. You can watch it with full filters, but be aware that you may have many question marks pop into your head as you go.